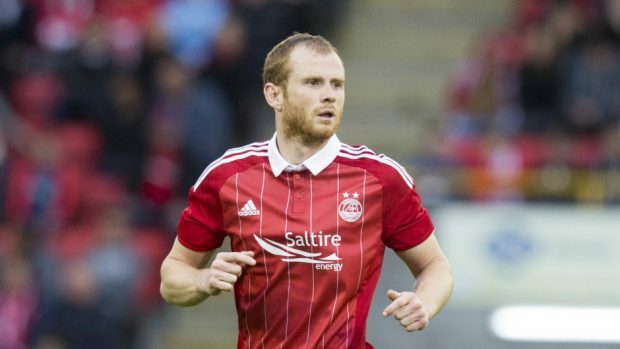 Aberdeen's Mark Reynolds was part of the Dons side that missed out on second four years ago. Aberdeen defender Mark Reynolds is on course to return in time for his side’s Scottish Cup semi-final against Hibernian. The Dons defender underwent an operation on a groin injury two weeks ago but his recovery is going well and McInnes expects to have the 29-year-old back before the Hampden game. McInnes said: “I don’t want to put pressure on Mark but he’s on schedule which is pleasing. He is back running with the physios and I’d say he is a couple of weeks away from rejoining the squad. Niall McGinn trained with the first-team squad yesterday, while Jonny Hayes will rejoin his team-mates today following his first start for the Republic of Ireland in their 1-0 defeat by Iceland on Tuesday. McInnes expects both players to be available for tomorrow’s Premiership match against Dundee at Dens Park. With four matches to go before the split and with his side holding an eight-point lead on third-placed Rangers, the Aberdeen manager knows it is important his players, who have taken 21 points from their nine league matches in 2017, continue their fine form. McInnes said: “We’ve got four games before the split and three games in a week but it is always dangerous to look any further ahead than the first game which is Dundee. “They’ve put in some good performances at home and got some big results to go with those displays so we are mindful of the threat they present and our full focus is on them. “But as the games start to count down each game takes on greater significance and we want to keep our good run going. We’re playing well and in terms of effort the players can’t give any more than they’ve been doing for me every week. “I’ve got options on the bench and I know the guys waiting for their chance are capable of going on to the pitch and giving me a performance. That breeds confidence but we’re not overconfident.